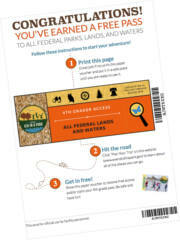 U.S. fourth-grade (or home-school equivalent) students can get a FREE pass to all federal parks, lands and waters. Print and show this paper voucher to receive FREE access and/or claim your 4th grade pass. The pass is for the 2018 to 2019 school year. It expires August 31, 2019.